I still hear this a lot. Well, it just aint’ true. 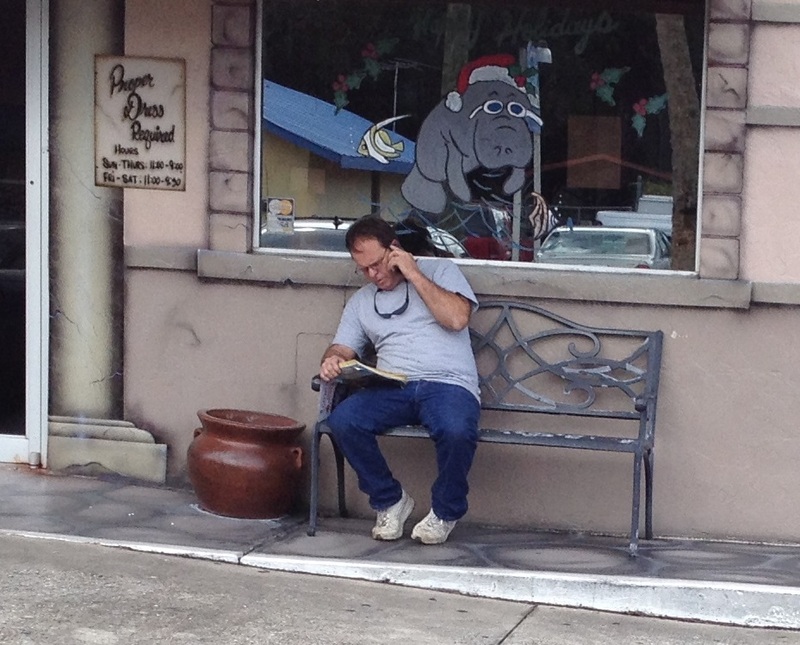 Case in point — as I was about to enter a local pizzeria the other night to come upon this person, book in hand (our New Smyrna Beach yellow pages, not the Telco book) locked in an intense discussion with what sounded like a sibling, providing them with a list local service providers they should be contacting them. Since I didn’t want to be obvious what I was doing the picture was taken from the other side of the parking lot. And yes, that appears to be an iPhone in his hand. Ouch. The digital fanatics’ aren’t going to like this one: As reported in the USA Today — Most small businesses feel like they are wasting their time on social media, according to a new survey. The survey indicated that about 61% of small businesses don’t see any return on investment on their social-media activities, according to a survey released from Manta, a social network for small businesses. Yet, the big disconnect is that almost 50% of those SMB’s say they’ve increased their time spent on social media. What’s going on? 17% said to boost awareness. And I’m willing to bet that 90+% of them think it’s cheaper than traditional media like print Yellow Pages. And it may be at the onset. But isn’t it usually true that you get what you pay for? How many jobs do think this pool company could get from a print and online Yellow Pages ad program over the course of a year? I would be willing to bet it far exceeds what they are getting from Facebook. Perhaps the industry can help SMB’s through this dilemma. Aren’t we the people who do the “fact finding” on each and every call to help identify where a business stands? And aren’t we the industry that has simple, one stop solutions in print, online, and mobile? In Yellow Pages sales, it’s a super critical moment. You’ve finally scored that face-to-face meeting with the decision maker at a potential new advertiser. You’ve done your prep work and you’re ready to rock and roll. But you are not really sure (comfortable) with how to best get the ball rolling, to get past the first few awkward moments of small talk and start building a business relationship. You can feel that knot building in your stomach. Some people can start up conversations with complete strangers with total ease. It almost seems natural to them. You’ve seen them at business meetings, cocktail hours, greeting new coworkers at lunch, or even with new customers. They seem to have the gift of getting the conversation going seamlessly. 1. Take a deep breath: As you start this process don’t lose sight of your overall objective – you just want to establish a repore with this person, one that can make the business part of the conversation flow much easier. From the advertisers prospective, when was the last time anyone wanted to spend 15 minutes or more just hearing about them and their buisness?? Most likely that hasn’t even happened with their spouse. You also want to get yourself comfortable and settled so you can do your job – identifying needs that this business has. If you let them speak 80% of the time, then you will be considered as a courteous, trust worthy person. Given that most small business owners are busy people (or at least want to be perceived that way), they will make it very clear when they are ready to switch from chit-chat to business. 2. Reframe the purpose of your visit (in your own mind): and this may to go against all of your training — don’t make sales calls – make a service call. If you take a step back, aren’t you really in the business of helping others be more successful in their businesses? When you call on a potential customer, is it any different from helping a neighbor with a project, visiting a friend in the hospital, or reaching out to help a family member struggling with a serious personal problem?? Net net – isn’t it an opportunity to be of service? 3. Start by making the first move – Simply put, you take the initiative. Experts say it takes only three seconds to make a first impression. That doesn’t leave you much time. Get that hand out, put your best smile on, and start the greeting. When you make the first move, you create some energy and project yourself in a confident manner. It takes a little practice if you are uncomfortable doing it, and we’re not suggesting you over do this – you don’t want to be diving across the desk to tackle them. With a little practice you will start the conversation stronger and it makes the early small talk a lot easier. 4. Find common ground fast… “Common ground” are those life intersection points we seek with people we meet for the first time. This is how we connect with people we do not know. Current weather is an overly simplistic one and not a very unique one. Topics could range from geography, education, hobbies, kids, colleges, sport teams or many others which can make up the general opening topics of conversation. My suggestion is you be quickly looking around in that decision makers office – what pictures do they have out, do they have their college football teams schedule up, an award they have received, something to help you get started. The general rule of thumb is to then take no more than two good shots (three at most) at finding common ground in a conversation with someone. If you have nothing in common, ok, don’t feel bad about it. They know it too. Most likely they will want to just get down to business at that point. 5. Use Their Favorite Word — their name. Studies show that a person’s favorite word is their own name (hey, it’s all about me). As soon as the prospect tells you his or her name, write it down and then use it at least three times during the call. — Future predictions: If they are sports fans, ask the person what they believe will happen in the next year for their favorite team. 2012 was a big year for politics, but I wouldn’t suggest you go there as there is at least a 50/50 chance they are on the other side of spectrum from you. The point is to create dialogue, and speculation about the future can do just that. — What’s changed: Ask the person what changes have occurred in the particular area of family, sports, business or some other topic over the past year. This creates a conversation rather than an interrogation with monosyllabic answers. For example, kids grow quickly – that picture from the kids soccer game is probably a couple of years old. Are they still playing? — If you get pushed to business immediately, how did you find/meet your prospect? Did someone refer them? Did you find out about them through a cold call or a network meeting? This is not an insignificant phase, so do not take it for granted. For example, if someone has referred the prospect to you, the prospect is more likely to have faith in you than if the prospect had never heard of you before. 7. Silence is ok – I’m sure you have a friend like my buddy Amy (not her real name) who feels the need to fill every silence of longer than 2-3 seconds. This gets her trapped into conversations that she would like to exit, but has to re-engage in to avoid awkward moments. Let the silence hang for a moment. 8. Chat for how long? This is the toughest one to gauge. I’ve seen people that want to get right to business and others that will want to chat for an hour. The point is — be patient. At some point they will turn to you and say “…what do you have?” That’s the cue to open up your binder/case/whatever and start the formal part of the sales conversation. Would you spend $4 million to be “Liked” for 30 seconds? The big game is set. Super Bowl XLVI will be on CBS next week featuring the San Francisco 49er’s vs. the Baltimore Ravens. And Americans are going to love it. But you already know all that. The raw dollars spent in the United States for the big game by the public, by teams and by advertisers will be an astronomical sum when you start to add it up. But is it really worth it for advertisers? Some factoids: Superbowl-ads.com indicates that Super Bowl TV ads are selling for up to $3.8 million on average for the 30-second spots, but CBS reportedly has already sold out rumors are any remaining spots can be had more than $4 million, for a single 30-second spot. That average is up by $300,000 from the $3.5 million published rate for the 2012 Super Bowl. Advertisers that we will hear from are: Anheuser-Busch, AXE, Best Buy, Cars.com, Century 21, Coca-Cola, Doritos, Fiat, Ford/Lincoln, GoDaddy.com, Hyundai, Kia, Kraft’s MiO, Mars, Mercedes-Benz, Milk Processor Education Program, Paramount, PepsiCo, Skechers, SodaStream, Taco Bell, Tide — Proctor & Gamble, Toyota, Volkswagen and Wonderful Pistachios. If we just take 35 ads, this comes to roughly $133 million spent by advertisers at the $3.8 million average. Note to readers: do any of those names spend money in print, online, or mobile Yellow Pages?? The Nielsen Company showed that the broadcast of the prior Super Bowl on NBC had an average audience of 111.3 million viewers and was said to be the most-watched television program of all time. The game was viewed in roughly 53.3 million households, with a 47.8 U.S. household rating. It will probably not surprise you to know that American adults like watching Super Bowl commercials just as much as game itself. According to a survey released by Chicago-based market research company Lab42, some 39% percent said the commercials were their favorite part of the game while only 28% said watching the football game was their primary interest. Stuffing ourselves with food, and the halftime show were No. 3 and No. 4, respectively. $4 million for some “buzz”?? Sure, Super Bowl ads are entertaining. Who doesn’t remember the epic, breakthrough Apple “1984″ advertisement for the Macintosh that only ran once. This year’s crop will feature things like a Kia ad for the Sorento SX Limited crossover SUV shows toddlers and baby animals rocketing to Earth from outer space. So who is making money from Super Bowl ads? The TV network running the game. Sport Business Daily said that over the last 10 years, the Super Bowl has generated $1.72B of network TV ad sales from more than 125 marketers, according to data from research firm Kantar Media. From’02-11, A-B InBev, PepsiCo, GM, Disney and Coca-Cola were the top five advertisers and accounted for 37% of all Super Bowl advertising during that time frame. The average rate for a 30-second spot during the Super Bowl has increased by 40% during the past decade, reaching around $3.1M last year on Fox and closer to $3.5M this year on NBC. Listed below is a trend for the average cost of a 30-second spot during the Super Bowl, along with total ad spend for the game (compliments of Kantar Media). The Superdome: As of Tuesday 1/22, the lowest priced ticket on the Ticketmaster website was $2,387, and the highest priced ticket was $13,120. Stubhub listed tickets starting at $2,119 per ticket. Regular football game seating at the Superdome accommodates about 69,700. Even just at the base price, and averaging the lowest ticket prices seen, this comes to $2,253 for an average entry-level ticket. If all 69,700 seats averaged this, the tally comes to just over $157 million. However, remember that The Superdome has undergone $336 million in renovations since Katrina, followed closely by $300 million in improvements to Louis Armstrong International Airport. Chicken wing sellers: According to the National Chicken Council, Americans will eat some 1.23 billion chicken wings over Super Bowl weekend. This is projected to be down about 1% from a year ago, but the drop is due to prices impacting production rather than demand. Wholesale wings are currently at about $2.11 a pound (in the Northeast), up 26 cents or 14% from a year earlier. Pizza companies: the Super Bowl is by far the busiest day of the year for pizza sales. Figures from 2012 showed an expected 4 million pizzas being sold by restaurants alone. That is not counting the frozen pizzas from grocery stores nor the diehards who make their own pizzas from scratch. Statistic Brain said that Pizza Hut sold 2 million pizzas during the Super Bowl in 2012. Domino’s delivery drivers are expected to log about 4 million miles on Super Bowl Sunday. Beer/wine/booze in general: Saveonbrew.com had an infographic for the 2013 Super Bowl showing the following: 50 million cases of beer will be consumed, resulting in more than 2 billion gallons of water being needed latter to flush away the beer consumed. The other downside is that roughly 7 million people will be calling in sick after the Super Bowl because they are hung-over. The city of New Orleans: The New Orleans Metropolitan Convention and Visitors Bureau were quoted as saying that the Super Bowl will generate $300 million to $400 million in direct spending. The New Orleans Tourism Marketing Corporation said that the Super Bowl is expected to have a $432 million economic impact on the city. Not broken out in these cool stats are of course, Yellow Page advertisers, as many of them will benefit from those looking for those wings, pizza’s, liquor stores, etc. etc. etc. The good news for them is that they aren’t spending $4 million to be “liked” and their print, online, and mobile Yellow Pages advertising programs will continue to be work for them 24/7/365 long after the 49er’s have crushed those pesky Ravens…. Does your advertiser know the shifting demographics of their customers? One of the most critical parts of the sales call is the fact-finding stage. And an important part in that effort is to clearly identify whether the advertiser truly knows the demographics of their customers. For any business, demographics are an important tool in doing business effectively, but in many ways the traditional profile of those buyers is shifting dramatically. For example, parts of the Annual Social and Economic Supplement to the Current Population Survey from the US Census Bureau identified one key shift: American households are getting smaller — and are predominantly headed by older adults. The average population per household now stands at 2.55, down from 3.67 in 1948. Much of that decline is attributable to the growth in 1-person households, which have almost quintupled in number from 1960, and now account for 27% of all households. Households headed by 30 to 44 year-olds has plummeted from a peak of 34% in 1990 to just 26% this year (effects of aging of the Baby Boomers). 39% of households are headed by adults aged 45-64. Data shows that the percentage of households headed by adults aged 75 and older has grown from 6% in 1960 to 10% this year. More than half of householders 75 and older live alone as of this year. That compares to less than one-quarter of householders less than 30 years old. There are now 7.8 million couples living together without being married, more than double the 2.9 million from 1996. Married households make up 49% of all households, down from 71% in 1970. 52% of married couples have both husband and wife working outside the home. That’s down from 56% in 2000. The percentage of stay-at-home parents who are fathers has grown from 1.6% in 1994 (76,000) to 3.6% this year (189,000). Among married-couple parents with children younger than 15, the percentage with stay-at-home mothers is estimated to be 24%. 85% of single-race Asian children live with 2-parent families (whether married or not). That proportion drops to 77% among single-race white non-Hispanic children, to 66% of Hispanic children, and all the way to 38% of single-race black children. As you can see, some of these changes are significant, and I’m not sure most business owners are aware of them. Those that do understand they may now have to tailor their advertising message differently such as highlighting special services or features, or even consider different artwork or photography to better match, or even cater to, these shifting demographics. Do these businesses know that the goal posts may have shifted on them?? Are you helping your advertisers find “NEDICT”s?? Every small business wants to grow. But how can they do that? The simple answer is they need to target their advertising towards the “NEDICT”’s. Now matter how static you may perceive a small town to be, you would amazed at the changes they occur each year in that town. Just compare the white page listings year to year and you will see the new people that have moved in to town, and unfortunately those that have moved on. This is great news for an SMB’s – they need to be able to reach those 20-25% of new people in their community that don’t know them, haven’t heard about them, or don’t even know their business exists. This crop of new comers is needed to replace those clients that every business will lose each year. Does the businesses advertising message speak to these new people in their market?? New comers could also be those consumers who may be new to the need to the products and services offered by the SMB. An example may be the first time homeowner. If they’ve rented a home or an apartment or lived with parents up until the purchase of their first home, they’ve not likely needed the services of say a landscaper, a roofer, an air conditioning contractor or many other businesses. Now that they have become homeowners, the need for such services will arise. The most classical use noted for a print Yellow Pages is when that water pipe has burst, there’s water everywhere and a consumer needs someone NOW! Let’s face it – emergencies happen. It is called “life”. And often they come up when we least expect them. If a directory can contain upwards of 4,000 potential headings, there is no way a consumer/buyer can be an expert in all of those categories. That’s way it’s critical that an advertisers program speaks to what they can do in the case of an emergency, or how they will satisfy that wide range of urgent needs that pop up. Can you name a bunch of businesses you have dealt with where you weren’t happy with their products or services, and vowed to never again do business with them? That should an easy list to create. But what happens when you need that product or service again? The consumer/buyer needs to find another business to work with, thus, they go into the Yellow Pages without knowing who they’re going to call, only knowing who they AREN’T going to call! How often do you usually need to replace a roof, find an extended care facility for an elderly family member, find a veterinarian that has weekend or holiday office hours, replace a busted garage door, etc.. etc., etc. For many of us, these are unique, often one-time events. But when the need arises, where can I find the local SMB’s I need, and even get educated on what questions I should be asking?? Hint: it’s not in the newspaper, on cable TV, or over the radio. Even if I’m pretty happy with the business I have used in the past, human nature is to do at least some comparison shopping just to be sure I am getting the best deal and service available. What better place to do that than in a Yellow Pages where all of the provider’s of those products or services are group together in that same heading for my easy viewing. For example, your favorite, local, mom and pop hardware store — Ralphs Hardware, did you know they now have equipment rentals? And how would I know that unless that put that information in their ad? I’m sure each of you has a story about how sometime during your travels, you forgot something, your eyeglasses broke, you would really like to go to a sushi restaurant, or that you needed an office supplies store. You don’t know the area, what businesses are there, or even where can I find them? Another way to think about it – calculate the number of hotels in the area, add up all of the rooms they have, assume a 75% occupancy rate, and an average stay of 2 – 3 days, and the number of travelers you have in your market will astound you. All of those travelers, will have needs in a place they aren’t familiar with. These are just some of the core buying needs that bring consumers to local SMB’s. Which is why they need to make sure their advertising message speaks to each of them, in a comprehensive Yellow Pages program, in print, online, and mobile. Are you helping your advertisers (or potential advertiser) be found for each of these buying needs? A recent blog by S. Anthony Iannarino got me thinking. Building on his three core disciplines, the concepts really ring true for sales management in this evolving Yellow Pages industry. As Iannarino noted, being a sales manager isn’t easy. There are dozens of tasks and activities that dominate a sales manager’s day. You have a sales team which needs your undivided attention each day, senior management that wants to communicate with you, and then a family that would like you to come home at night at a more reasonable hour. Iannarino focused on three disciplines a sales manager absolutely must keep to succeed. Note these are not goals, they are daily disciplines that sales managers need as their priorities in the face of the many other distractions that come out each day. The difference between top performing reps and those that aren’t can often come down to one critical factor – activity, or more appropriately — the level of activity. Of course activity for activity’s sake doesn’t do anything to produce sales results. The activity I’m talking about has to produce outcomes, and the major outcomes that need measured are opportunities created and opportunities advanced – appointments made, appointments kept, as well as closes. For sales managers, keeping an active eye on a reps pipeline isn’t micromanaging. Inspecting and reviewing the status of the pipeline on a consistent basis isn’t a lack of trust in the rep. The simple reality is that without enough opportunities, the rep, the manager, and the company cannot make their numbers. The math doesn’t work. This discipline isn’t naïve enough to suggest the SMB owners don’t disappear for vacations, or get pulled off on emergency situations, or are ducking you because they are behind on their bills. These are a given and will happen. For managers the more operative value of this discipline is ensuring the pipeline has enough viable, closable opportunities to allow all parties to achieve their desired results. So managers, you have to continually inspect the pipeline to ensure that your sales team is producing and managing the opportunities they need to succeed. Wouldn’t it be nice if sales opportunities moved smoothly and evenly all through your campaigns? But how often does that happen. We are fast approaching Labor Day week. We all know that’s going to be a difficult time to catch up with many SMB’s as they head off for their last summer vacations or to be with kids heading back to school or college. Coaching these selling opportunities is the second primary discipline of a sales manager. It is also another discipline that must be done continuously. Riding with reps, ongoing role playing and other coaching techniques are needed to keep reps prepared for a constantly changing marketplace. But the other key part of coaching a team is to help them build/grow their capacity to move opportunities through their sales funnel on their own, and to remove any miscellaneous obstacles that stall or kill opportunities. Coaching opportunities is where you are expected to earn your pay. Have you noticed that the better your sales team is, the easier your job is? The inverse of this is also true, too: the worse your sales team, the more difficult your job is. It’s rare that any team is made up of all “A” players. No matter what level they are at, the only real asset you have producing sales results is your salespeople. The link is an obvious one — coaching is important to sales in that the more you develop your sales team, the better your sales team becomes, the better your sales results will be. Time spent coaching, teaching, training, and developing your salespeople can produce outsized results. But it also does require a time investment on the manager’s part. One of the most critical disciplines of the sales manager is building salespeople so they can overcome the challenges and obstacles they face themselves. These are very unsettling times in the industry, in many companies, in our overall economy. Things are changing constantly – new focus on products, changes in ownership, even some name changes (can you say “Hibu”?). The fourth item I have added to the list of primary disciplines is the need for sales management to filter all of this internal and external noise so sales can concentrate on the task at hand that day – making sales. As I suggested to one unsettled rep – look at it this way – you run your own small company. You have one client – your existing employer. Now you can change clients at anytime, but how’s this one treating you? And each client, no matter what industry has their own little quirks and requirements. Don’t get caught up in what the client is doing. Focus on your business. These are my suggested four key disciplines. Do you have others that should be added? ?